It’s like magic! But what does it mean? I’ve been mapping networks for some years now but in the past months I have used a more traditional approach to social network analysis for the first time. In a project with the United Nations University, we (Nancy White and I) are tasked to find out how their networks are structured and to initiate a debate around improving networks for increasing impact in Africa. Who of the people on this list have you ever interacted with? Who of these people do you currently collaborate with? Who would you like to work with but have not approached yet? etc. The questionnaire was administered by the people at Cross Analytics (at 4 US$ per participant they did a pretty good job in terms of support etc.) and all I had to do was wait for the results to be delivered to me in the square matrix format I need to enter it into Visualyzer. 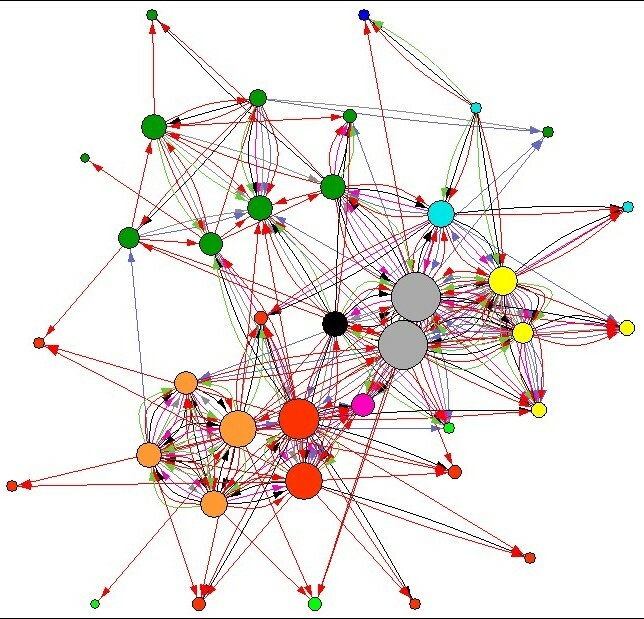 I was absolutely excited when I got the data because it did look like magic – out of the blue these interesting networks emerged and I could play around with them, exploring the structure, observing how they evolved over time and guessing what it all meant. And that is the biggest difference between participatory network mapping and a survey approach: With the survey you get the network structure but little of the background, the how and why. Sure, you can add non-network questions to the survey to elaborate the background. But often I only see the questions emerging while I draw the network, which means that after analyzing the survey results, I have more questions than answers… Confused but on a higher level… In this case that doesn’t hurt: The survey is planned as a first step in a longer process and an entry point for discussion, so I will get to ask all my questions. But how do researchers do it who only rely on one course of surveys? How do they find out what the network structures mean? Why doesn’t this drive them crazy? The Society for International Development in Washington DC will host another knowledge management event next week and they are giving me the chance to talk about Net-Map there. If you are interested, it’s a public brown bag seminar and it’s on the 10th of November, from 12:30 p.m. to 2:00 p.m.. You can register here.